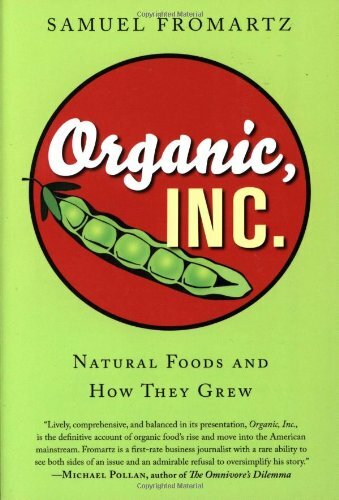 "Organic, Inc. is the definitive account of organic food's rise and move into the American mainstream." "In Organic, Inc., Samuel Fromartz gives us a uniquely American story—the emergence of Big Organics from humble origins in small, counterculture farms. Fromartz writes with the passion of an organic partisan but his account of the pros and cons of organics, big and small, is unusually balanced, honest, and compelling." Organic, Inc. tells how an $11 billion industry arose out of an alternative food movement, bringing backwoods idealists into the age of the organic tortilla chip. A juggernaut in the otherwise sluggish food industry, organic food is now a consumer phenomenon growing at 20 percent a year. But what is organic food? Is it really better for you? Where did it come from and why so many of us buying it? "The history of organic food is colorful, but these policy debates make this book important. Fromartz makes it clear just how precarious this movement has been, as regulators and advocates for the mainstream agricultural industry fight for exceptions in organic rules and small farmers are endangered by shrinking profit margins." "Fromartz does an excellent job of investigating consumer behavior and the trends that have permanently changed the food landscape. Two accounts, one describing how Silk soy milk stormed the marketplace and another on the rise of "spring mix," or mesclun greens, as the lettuce of choice, are especially entertaining to read. "With one eye on organic food’s past and one eye cast on its future, Samuel Fromartz has a comprehensive vision of an industry at a crossroads. Here is a voice that reminds us of our power as consumers. Anyone reading Organic, Inc. will be inspired to put his money where his mouth is." "Sam Fromartz has the ability to transform an important subject into an interesting one, as he does with this vivid, vital book, Organic, Inc. No, it's not a new wave or diet book. It's a book that will alter the way we think about what we eat and the business forces that shape what we eat." "Fromartz's portrait of the adolescent industry reveals that that success has prompted an epic identity crisis... If big business is now the muscle of the organic industry, Fromartz demonstrates that small growers remain at its heart... This is a pragmatic, wise assessment of the compromises the organic movement has struck to gain access to the mainstream." "Serves as an extension of the farmer's market ideal: to put a human face on the otherwise anonymous food-supply line."